Ireland is called the Emerald Isle for the vivid colour of its rolling plains, its fields, its forests, and its high, wooded mountains. Johnny Cash sang about Ireland having forty shades of green, and he may have been right. The green is punctuated by the blue of hundreds of lakes, fed by rivers that ribbon through the land. The River Shannon is the longest in Ireland, winding its way down from Cavan to Limerick, where it empties into the Atlantic Ocean. Once one of the poorest nations in Western Europe, Ireland is now a prosperous country with one of the highest per capita incomes in the world. In recent years, the focus of its economy shifted from agriculture to services, the high-tech industry, trade and investment. Ireland has a 99% literacy rate and high rankings for its education system, political freedom and civil rights, press freedom, economic freedom and quality of living. Its population is the fastest growing in Europe. Ireland’s green beauty has attracted many visitors from around the world, but there are other reasons why they are drawn to the Emerald Isle. Ireland’s contributions to world literature and music are considerable; from Yeats to U2, its small population has produced more than its fair share of great poets, playwrights, novelists, music acts, singers and dancers. 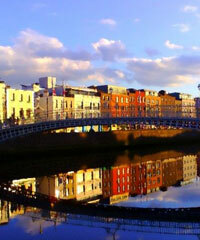 And Ireland’s rich trove of legend, history and culture serves as inspiration to artists all over the world. Throughout Ireland there are charming historic towns, splendid cliffs and beaches along the coast, and old castles and monasteries dotting the countryside. These are always a draw for tourists, though Ireland’s vibrant, modern cities are also attracting visitors from all over the world. 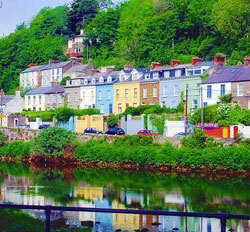 The capital, Dublin, is always a treat, but the cities of Cork and Galway are now making it to many top 10 lists as well. And whether they are in the smaller towns or in the bigger cities, Ireland’s iconic pubs are always a welcome sight. Across the Irish Sea from Ireland is Great Britain. The northeastern part of Ireland is Northern Ireland, one of the four countries that make up the United Kingdom. It consists of six of the nine counties of the Irish province of Ulster. The rest are part of the Republic of Ireland. Ireland is divided into 26 counties. In general, the country’s climate is temperate and rather mild. Summer temperatures rarely reach higher than 20 degrees Celsius; winter temperatures go no more than 6 degrees below zero. Snow is uncommon in winter, but rain frequently waters Ireland’s green plains. It rains as much as 275 days a year in some areas.